What Colors Are Yorkie Terriers Coats? AKC does not recognize solid-colored Yorkies. You may have seen Yorkies in a variety of colorings. The American Kennel Club only recognizes four standard colorings -- black and tan, black and gold, blue and tan, and blue and gold. Parti-color is the one AKC accepted alternative coloring. The dominant color combination for a Yorkshire terrier is blue and tan or blue and gold. Black is a recessive color in Yorkshires. Puppies born black and tan or black and gold will change to blue and tan or blue and gold unless their parents had the recessive black gene. The black coat can begin to change or break blue as early as 8 weeks. The result is a dark steel blue. The tan or gold markings deepen with age. The tan or gold on a puppy may be intermingled with the black or may be delineated from the black. A white star or blaze is sometimes apparent on the fore chest. Small white marks on the toes and a white line on the lower fore jaw will disappear as the puppy grows. If there are large amounts of white markings on the chest, paws, jaws and skull, the dog is given a tri-color classification and not a true standard coloring. Parti-colored Yorkshires are tri-colored. They usually have a gold or tan head and a body that is mostly white with some black patches. Parti-color is a recessive gene, so blue and tan Yorkshire terriers can produce a parti-colored pup in a litter with black and tan pups. The American Kennel Club allowed the registration of parti-colored Yorkies in 2000. 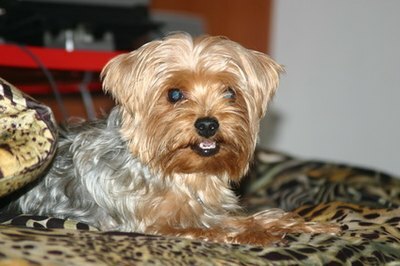 There is some controversy, for some breeders feel a parti-colored Yorkie indicates the breeding line is not pure. Some Yorkies are golden, chocolate and even blonde. These are purebred Yorkshire terriers that are the result of mating parti-colored, standards or parti-carrier Yorkies. Parti-carrier Yorkies carry the parti-colored recessive gene. Questionable breeders are mating purebred Yorkies with other Yorkie breed mixes to produce a variety of coat colors, including solid-colored Yorkies. Before purchasing a Yorkie, research reputable breeders. Ask to see the lineage of your puppy. A reputable breeder can answer all your questions.